British Prime Minister Gordon Brown met with President Obama in the White House last week for an exchange of words and gifts. Things have gone from bad to worse in the ongoing saga of President Barack Obama's gift-giving blunder. 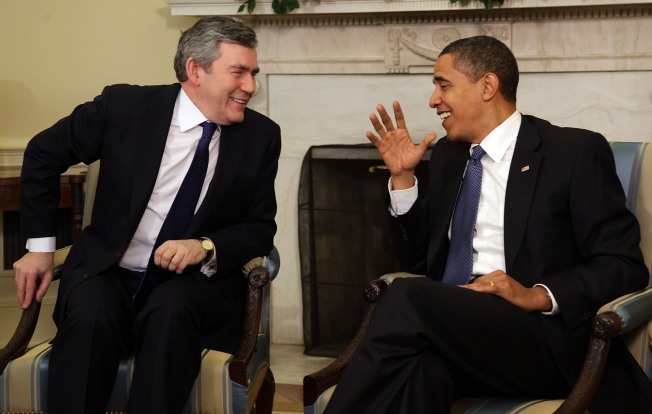 It started last week when UK leader Gordon Brown paid a visit to the White House. As a token of respect, Brown gave Obama a pen holder carved from the wood of the HMS Gannet, sister ship of a 19th century Navy war vessel used on anti-slavery missions, whose oak was used to fashion the Oval Office desk. In return, Obama presented Brown with--drumroll, please--a DVD box set. If that wasn't bad enough, it turns out the DVDs only work in North American Region 1 DVD players, the Daily Telegraph reported. Luckily, Brown doesn't seem to be taking the "wrong region" message too seriously. A spokesman for the prime minister said any gift Obama gave Brown would have been "well thought through." He then referred the Telegraph reporter to the White House for assistance on the "technical aspects" of the gift.